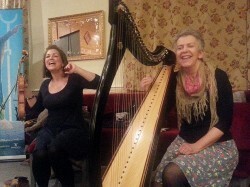 Angharad Jenkins was born with Welsh music in her ears – and her harp-playing mother Delyth made quite sure of that. The pregnant Delyth played with Peter Stacey and Stevie Wishart in the excellent trio Aberjaber, and the “bump” was baby Angharad – and now she has grown into an impressive fiddler, with several musical projects including the sizzling Calan, Adran D, and accompanist to Brigyn and Blair Dunlop under her belt. Both mother and daughter go by the attractive name of DnA, and they have released a four-star debut album; this was their first concert at Llantrisant Folk Club, and members and guests revelled in the satisfying and wonderful sound these two generated. DnA’s unique music is completely peaceful and satisfying, feeding on their rich tradition and, in turn, spectacularly nourishing it. Llantrisant Folk Club member Paul Seligman shot these two videos of DnA performing a medley of tunes, starting with Angharad’s composition ‘Gan Bwyll Jo!’, and their take on the famous Llanelli song, ‘Sospan Fach’. Paul also took the picture of DnA (left).